Baccarat is a casino card game. It is believed to have been introduced into France from Italy during the reign of Charles VIII of France (ruled 1483-1498), and it is similar to Faro and to Basset. There are three accepted variants of the game: baccarat chemin de fer (railway), baccarat banque (or à deux tableaux), and punto banco (or North American baccarat). Punto banco is strictly a game of chance, with no skill or strategy involved; each player's moves are forced by the cards the player is dealt. In baccarat chemin de fer and baccarat banque, by contrast, both players can make choices, which allows skill to play a large part. Baccarat (pronounced bak?ra?) is a simple game with only three possible results - 'Player', 'Banker' and 'Tie'. The term 'Player' does not refer to the customer and the term 'Banker' does not refer to the house. They are just options on which the customer can bet. In Baccarat, cards 2-9 are worth face value, 10's and face cards (J, Q, K) are worth zero, and Aces are worth 1 point. Players calculate their score by taking the sum of all cards modulo 10, meaning that after adding the value of the cards the tens digit is ignored. For example, a hand consisting of 2 and 3 is worth 5 (2 + 3 = 5). A hand consisting of 6 and 7 is worth 3 (6 + 7 = 13 = 3) - the first digit is dropped because the total is higher than 10. A hand consisting of 4 and 6 is worth zero, or Baccarat (4 + 6 = 10 = 0). The name "Baccarat" is unusual in that the game is named after the worst hand, worth 0. The highest score that can be achieved is 9 (from a 4 and 5, 10 and 9, or A and 8, etc). In the United States, Canada, Australia, Sweden, and Macau, a variation of baccarat is played in which the casino banks the game at all times. Players may bet on either the player or the banker, which are merely designations for the two hands dealt in each game. If either the Player or the Banker achieves a total of 8 or 9 on the initial deal (known as a 'natural'), no further cards are drawn. If not, play proceeds as follows. If the Player has an initial total of 0-5, the Player draws a single card. If the Player has an initial total of 6 or 7, he stands. If the Player drew an ace, 9, 10, or face-card, the Banker draws if he has 0-3, and stands if he has 4-7. The croupier will deal the cards according to the tableau and the croupier will announce the winning hand - either 'Player' or 'Banker'. Losing bets will be collected and the winning bets will be paid according to the rules of the house. Usually even money or 1-1 will be paid to the player and 95% to the 'Banker', 5% commission to the house. (Commission Baccarat) Some casinos pay even money or 1-1 to both 'Player' and 'Banker' except when the 'Banker' wins with 6. Then the 'Banker' will be paid 50% or half the original bet. In this scenario the house edge on a banker bet is 1.46%, whilst the house edge on player and tie bets remain the same as commission baccarat. Should both the 'Banker's' hand and the 'Player's' hand have the same value at the end of the deal the croupier shall announce "Egalite - tie bets win." All tie bets will be paid at 8 to 1 odds and all bets on 'Player' or 'Banker' remain in place and active for the next game (the customer may or may not be able to retract these bets depending on casino rules). 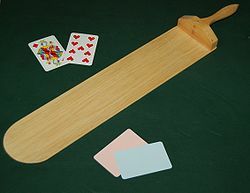 The traditional form of punto banco baccarat is played at an oval table, similar to the chemin de fer version. The table is staffed by a croupier, who directs the play of the game, and two dealers who collect and pay bets as well as tallying commissions due. Six or eight decks of cards are used, normally shuffled only by the croupier and dealers. Like chemin de fer, the shoe is passed around from player to player, who acts as the dealer of the cards and as "banker," but he or she does not actually bank the game. Indeed, the "banker" may bet on the player hand if he or she wishes, or may pass the shoe along to another player — the role of the "banker" is merely ceremonial. The person who bet the highest amount on the player hand is given the player-hand cards, though he or she simply turns the cards over, announcing their total. The croupier instructs the "banker" on if or when to deal third cards, and then announces the winning hand. In casinos in Las Vegas and Atlantic City, this version of baccarat is usually played in special rooms separated from the main gaming floor, ostensibly to provide an extra measure of privacy and security because of the high stakes often involved. The game is frequented by the highest of high rollers, who may wager tens or hundreds of thousands of dollars on a single hand. Australian tycoon Kerry Packer was particularly fond of the game, having won and lost large sums over the years. Minimum bets are relatively high, often starting at 25 USD and going as high as 500 USD. Posted maximum bets are often arranged to suit a player, but maximums of 10,000 USD per hand are common. Because of its attraction for wealthy players, a casino may win or lose millions of dollars a night on the game, and the house's fortunes may even affect the bottom line of a corporation's quarterly profit and loss. Notations of the effects of major baccarat wins and losses are frequent in the quarterly reports of publicly-traded gaming companies. In the 3rd quarter 2007 the Las Vegas Sands Corp reported an unexpected net loss of $48.5 million (or 14c per share) from its high stakes baccarat and blackjack rooms. Wall St was unforgiving dumping the stock, share price in Las Vegas Sands Corp fell 6.8% on extended US trading. On paper Chief Executive Officer Sheldon Adelson's wealth dropped $2.1 billion overnight. Mini-baccarat is essentially the same game, but played at a smaller table very similar to a blackjack table. A single dealer handles the entire game, including dealing the cards. The pace is usually much faster than the "big baccarat" version. Betting minimums and maximums are usually lower. In casinos outside of Las Vegas and Atlantic City, this is frequently the only version of baccarat that is offered. Makccarat is a heavily modified version of the same game. Much like other versions of Baccarat, if either the 'Player' or 'Banker' has a natural 8 or 9, the game immediately ends; however, where neither the 'Player' nor the 'Banker' has 8 or 9, the side with the lowest score draws an additional card first. If that side's score becomes higher than the opposing side's score, the opposing side also draws a card. If, on the other hand, that side's score is unable to beat the opposing side's score, the game immediately ends with the opposing side winning. Where the initial scores of the 'Player' and 'Banker' are the same, the 'Player' draws the additional card first. For example, where the 'Player' has an initial score of 1 and the 'Banker' has an initial score of 0, the 'Banker' will draw an additional card first. If the 'Banker's' additional card doesn't raise its score, the game ends and the 'Player' is the winner. If the 'Banker's' additional card does raise its score beyond the 'Player', the 'Player' will then draw an additional card. Six full packs of cards of the same pattern are used, shuffled together. The players seat themselves around the table. In the center is a basket for the reception of the used cards. If there is any question as to the relative positions of the players, it is decided by lot. The person who draws the first place seats himself next on the right hand of the croupier, and the rest follow in succession. The dealer places before him the amount he is disposed to risk, and the players "make their stakes." Any punter, beginning with the player on the immediate right of the dealer, is entitled to say "Banco", meaning to "go bank," to play against the whole of the banker's stake. If no one does so, each player places his stake before him. If the total so staked by the seated players is not equal to the amount for the time being in the bank, other persons standing round may stake in addition. If it is more than equal to the amount in the bank, the punters nearest in order to the banker have the preference up to such amount, the banker having the right to decline any stake in excess of that limit. The banker proceeds to deal four cards face downwards: the first, for the punters, to the right; the second to himself; the third for the punters, the fourth to himself. The player who has the highest stake represents the punters. If two punters are equal in this respect, the player first in rotation has the preference. Each then looks at his cards. If he finds that they make either nine, the highest point at Baccarat, or eight, the next highest, he turns them up, announcing the number aloud, and the hand is at an end. If the banker's point is the better, the stakes of the punter become the property of the bank. If the punters' point is the better, the banker (or the croupier for him) pays each punter the amount of his stake. If neither party turns up his cards, this is an admission that neither has eight or nine. In this case the banker is bound to offer a third card. If the point of the punter is baccarat (i.e. cards together amounting to ten or twenty, = 0), one, two, three, or four, he accepts as a matter of course, replying, "Yes," or "Card." A third card is then dealt to him, face upwards. If his point is already six or seven, he will, equally as a matter of course, REFUSE the offered card. To accept a card with six or seven, or refuse with baccarat, one, two, three, or four (known in either case as a "false draw"), is a breach of the established procedure of the game, and brings down upon the head of the offender the wrath of his fellow-punters; indeed, in some circles he is made liable for any loss they may incur thereby, and in others is punishable by a fine. At the point of five, and no other, is it optional to the punter whether to take a card or not; nobody has the right to advise him, or to remark upon his decision. The banker has now to decide whether he himself will draw a card, being guided in his decision partly by the cards he already holds, partly by the card (if any) drawn by the punter, and partly by what he may know or guess of the latter's mode of play. If he has hesitated over his decision, the banker may be pretty certain (unless such hesitation was an intentional blind) that his original point was five, and as the third card (if any) is exposed, his present point becomes equally a matter of certainty. The banker, having drawn or not drawn, as he may elect, exposes his cards, and receives or pays as the case may be. Ties neither win nor lose, but the stakes remain for the next hand. The banker is not permitted to withdraw any part of his winnings, which go to increase the amount in the bank. Should he at any given moment, desire to retire, he says, "I pass the deal." In such case each of the other players, in rotation, has the option of taking it, but he must start the bank with the same amount at which it stood when the last banker retired. Should no one present care to risk that high a figure, the deal passes to the player next on the right hand of the retiring banker, who is in such case at liberty to start the bank with such amount as he thinks fit, the late banker now being regarded as last in order of rotation, though the respective priorities are not otherwise affected. A player who has "gone bank," and lost, is entitled to do so again on the next hand, notwithstanding that the deal may have "passed" to another player. When the first supply of cards is exhausted, the croupier takes a fresh handful from the heap before him, has them cut by the player on his left, and hands them to the banker. To constitute a valid deal, there must be not less than seven cards left in the dealer's hand. Should the cards in hand fall below this number, they are thrown into the wastebasket, and the banker takes a fresh supply as above mentioned. Any player may "go bank," the first claim to do so belonging to the punter immediately on the right of the banker; the next to the player on his left, and so on alternatively in regular order. If two players on opposite sides desire to "go bank," they go half shares. Baccarat Banque is the favored game of Ian Fleming's secret agent creation, James Bond. He can be seen playing the game in numerous novels – most notably 007's 1953 debut, Casino Royale, in which the entire plot revolves around a game between Bond and SMERSH operative Le Chiffre (the unabridged version of the novel includes a primer to the game for readers who are unfamiliar with it). 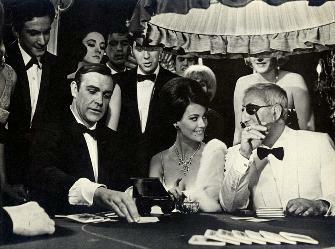 It is also featured in several filmed versions of the novels, including Dr. No, where the character is first introduced playing the game; Thunderball; the 1967 version of Casino Royale (which is the most detailed treatment of a baccarat game in any Bond film); On Her Majesty's Secret Service; For Your Eyes Only; and GoldenEye. In the 2006 new movie adaptation of Casino Royale, however, Chemin de Fer is replaced by Texas hold 'em poker largely due to its great popularity in America at the time of filming. In the film Rush Hour 3, Chris Tucker's character attempts to play Baccarat in a Paris casino while thinking it's blackjack. After telling the dealer to "hit him", the dealer reminds Tucker's character that "This is Baccarat". Later on, he has a hand of three kings, which added up to zero, causing him to lose. In the Pinky and the Brain episode Brain's Way, Brain builds a casino that only has Baccarat. An Australian court ordered Harry Kakavas to settle his $1 million debt to Atlantis Resort. Kakavas lost the amount in just 5 hours while playing at the baccarat table. Asia Properties finalized an MOU to acquire a 50.13% share of Sing Hou. Sing Hou offers VIP baccarat gaming tables to its customers. Visionary iGaming will give live dealer games to AmsterdamsCasino after finalizing a deal on November 19th, 2009. Both sides said that they expect a lot from the partnership. The closing of APIs investment in Macau VIP will take place in January 2010. API CEO Daniel McKinney said that their baccarat table earnings in Macau are steadily growing. GPI will feature its new RFID table applications like baccarat displays at the IGE 2010. The IGE 2010 will take place on January 26th, 2010-January 28th, 2010 in London. API Head Daniel McKinney said that their VIP baccarat earnings have surpassed their expectations. Baccarat accounts for the 88% of APIs gaming earnings in Macau. Evolution Gaming will be the main provider of live casino dealer games like Live Baccarat for Sportingbet. The two parties finalized their agreement on January 28th, 2010. Talisman filed a case against DEQ that alleged that DEQ tried to register EZ Baccarat in various jurisdictions without their consent. DEQ refused to comment on the issue. Fournier will be displaying its new gaming products like a security baccarat shoe at the 2010 IGE. Javier Berasetegui said that they are excited to show their new products. Betfair released its downloadable casino on January 22nd, 2010. Players can enjoy different casino games like baccarat.